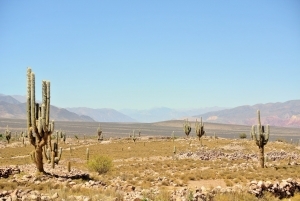 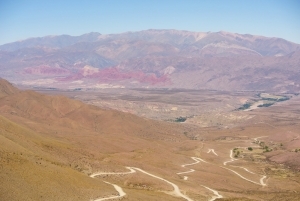 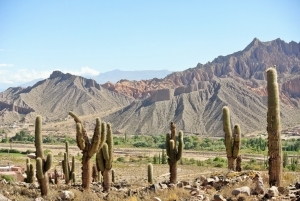 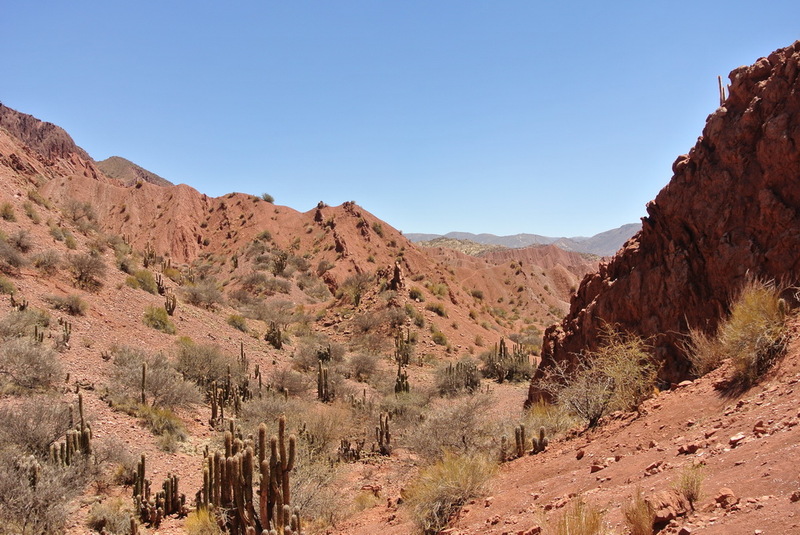 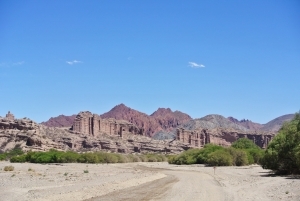 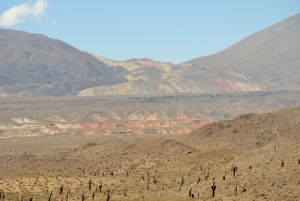 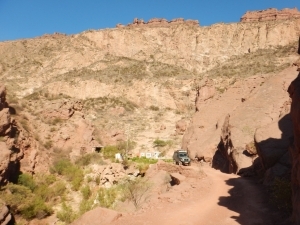 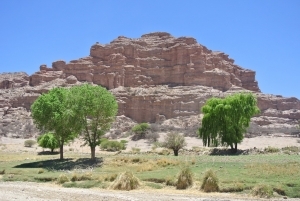 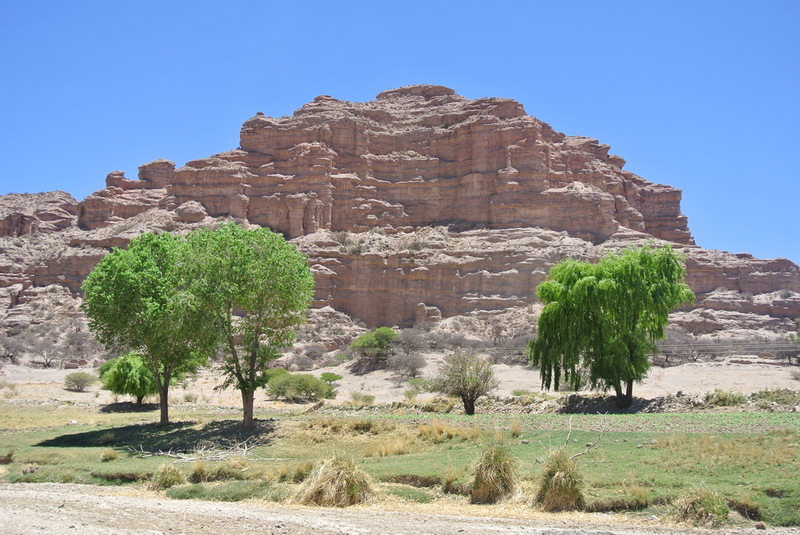 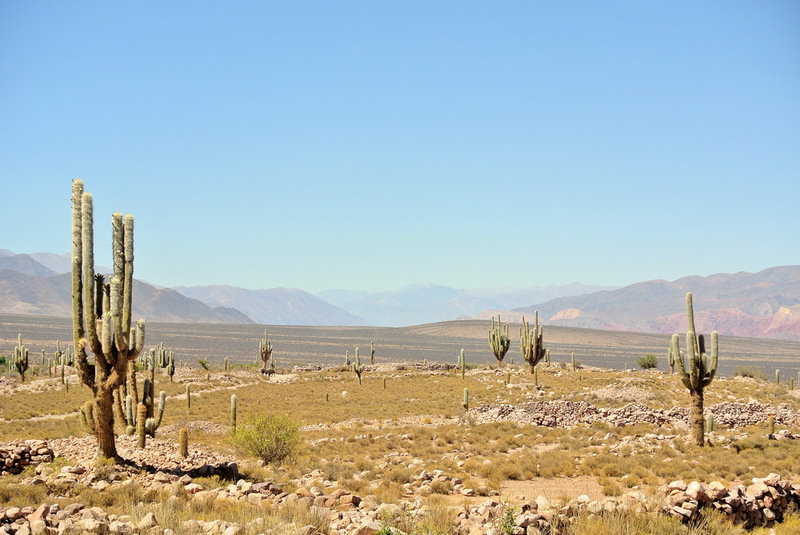 In the south of Bolivia, the landscape changes to become more arid, and here starts the area of the quebradas, typical of north western Argentina. 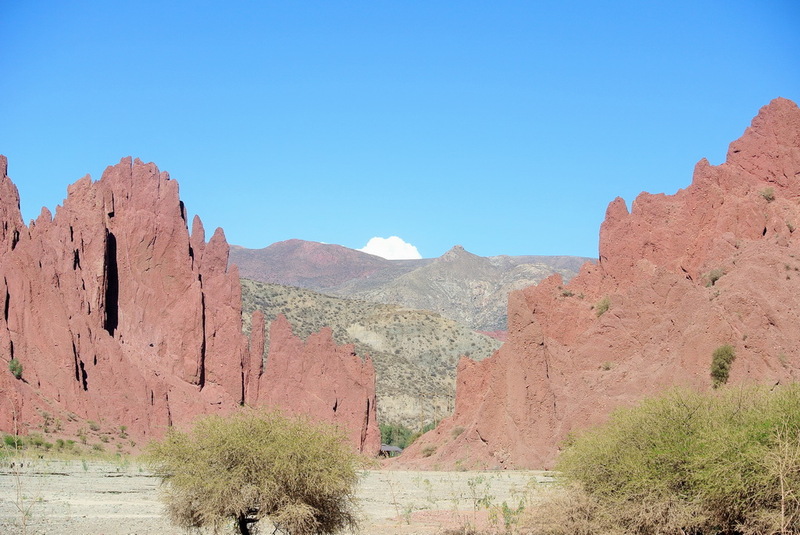 There are dried riverbed, these spectacular rock formations recall western USA with giant cactus. 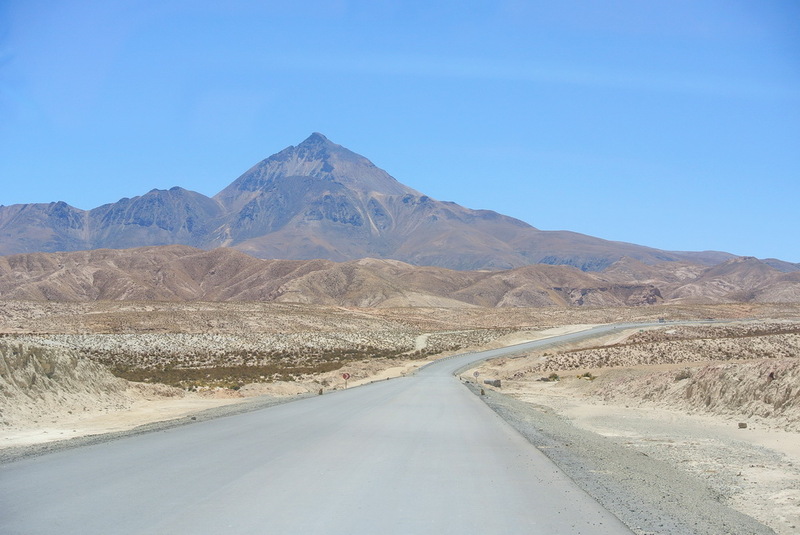 Leaving Uyuni, we use a nice national road, but still under construction -read "of very bad qualitiy"- which take us to some not-dry riverbed. 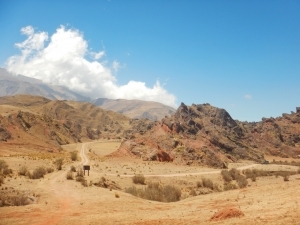 Nevertheless, the landscapes are great! 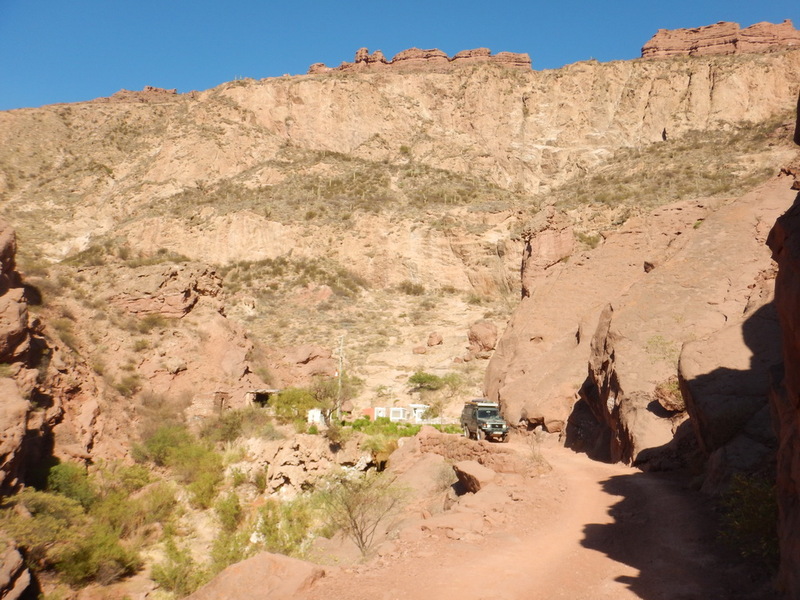 Once in Tupiza, Sophie tastes the hightest wine of the world (grapes grow at 2000m high), surounded by the red cliffs of Canyon del Inca where we stopped for the night. 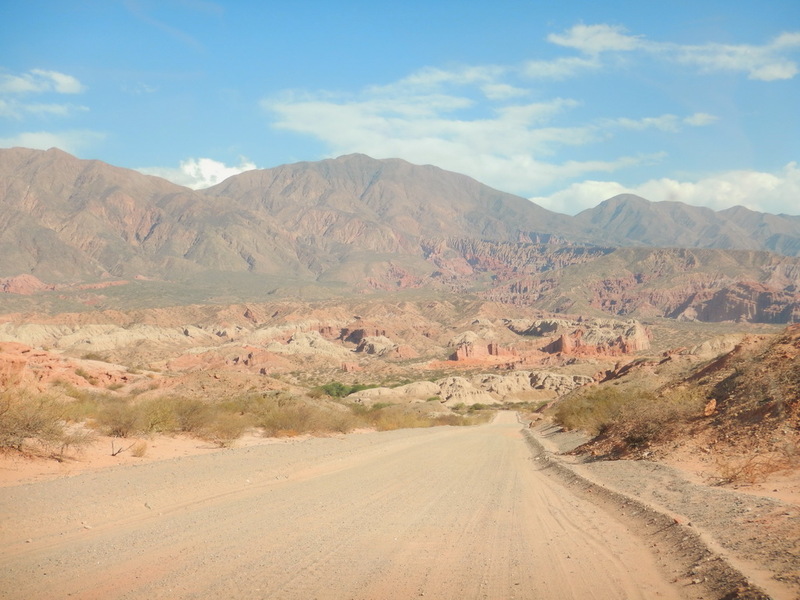 The next day, after a short walk in the gorges up to the devil’s gate we cross the border to Argentina. 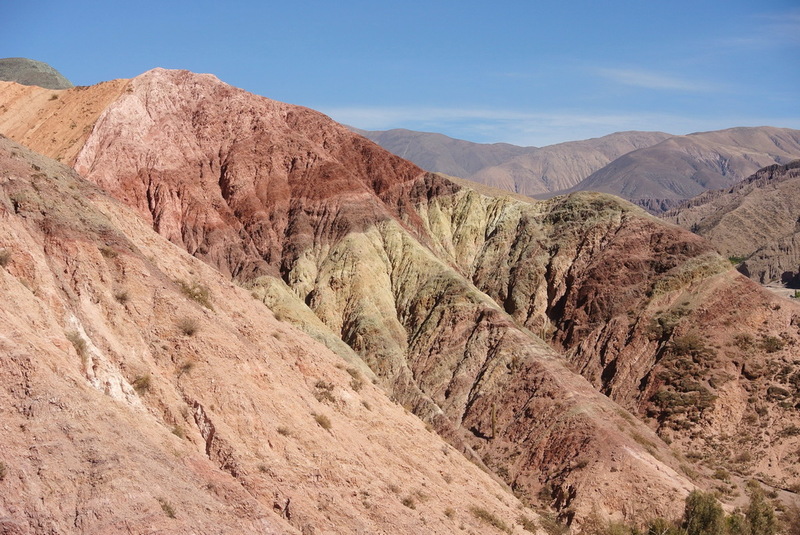 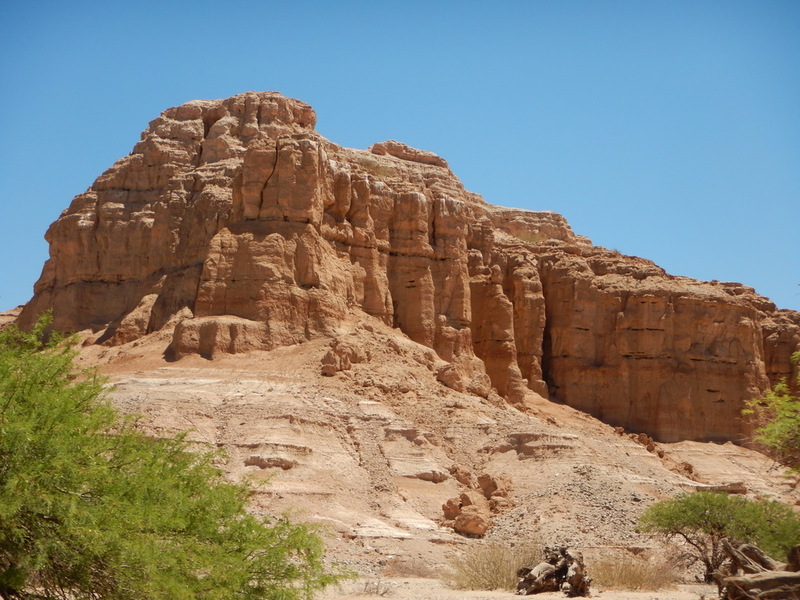 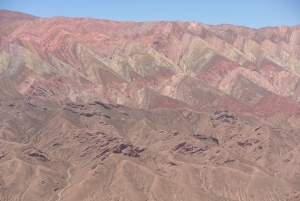 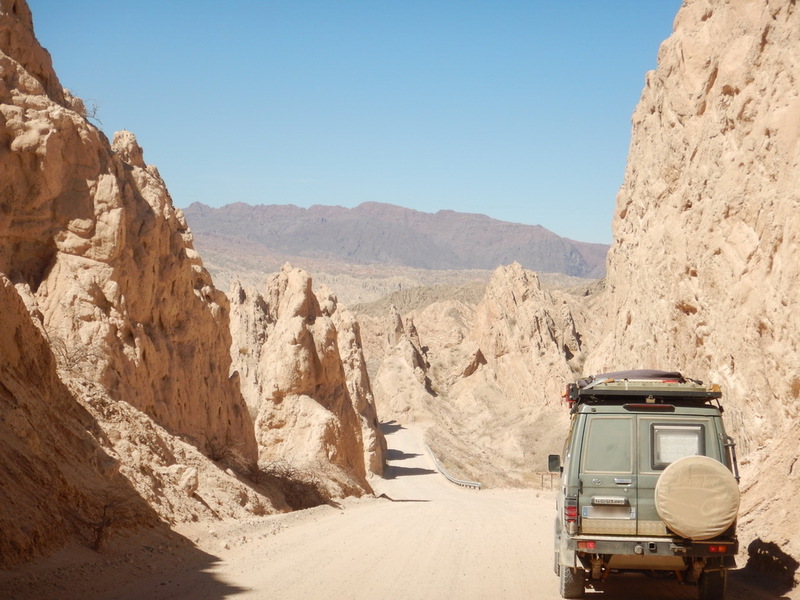 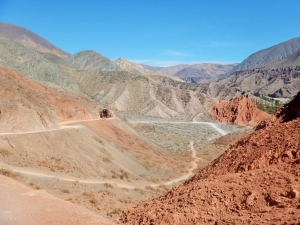 For the next 300km, the road goes through the famous quebrada de Humahuaca (UNESCO place...) and the mountains with colored layers come one after the other, competing on the amount of different colors (up to 14 according to the official figures). 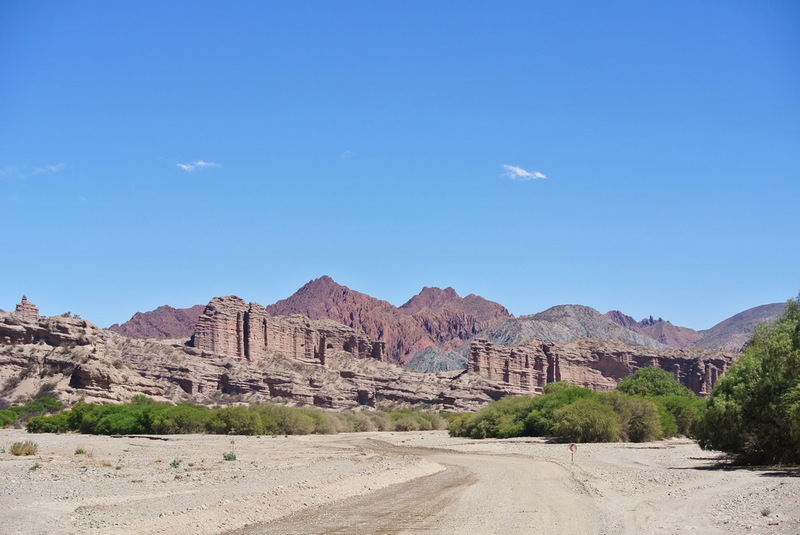 Here in this marvelous landscape, we meet a very friendly korean cyclist, his ankle injured. We ‘ll drive a bit with him. 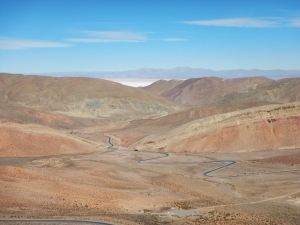 After Salta where we stock up food and do some mechanics, we head to the famous ruta 40 : more than 5000km from north to south along the andean cordilera! 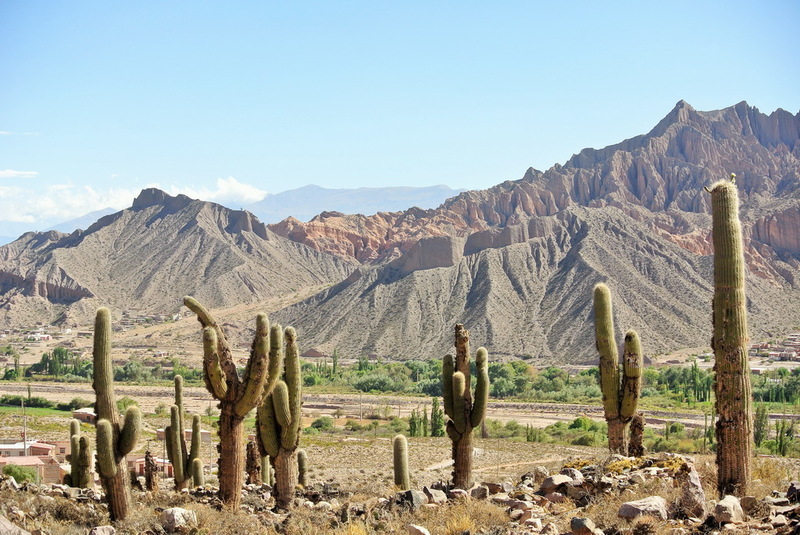 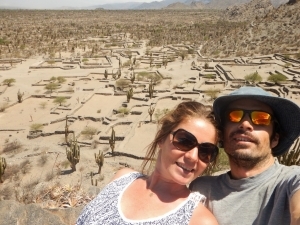 On the way, we drive through the nice los cardones (the cactus) and the valle encantada where we’ll have a short walk, and then drive up the cuesta del obispo. 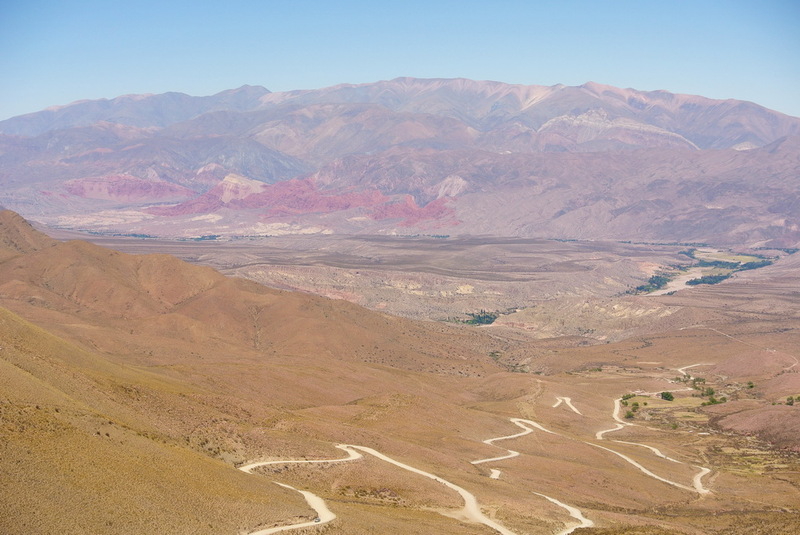 We are still far high, between 2000 and 3000m, and the whole area is extremely arid. 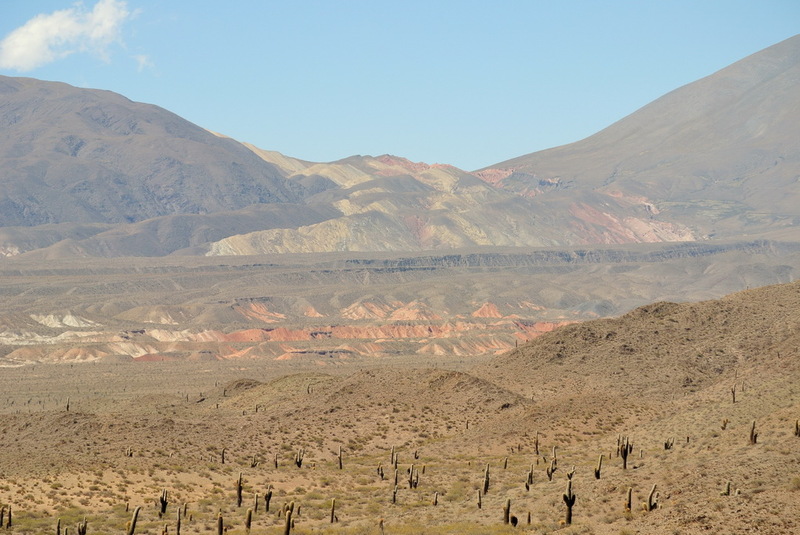 there’s little vegetation. The good news is that with argentinian diesel, the car works better and has almost stopped smoking! 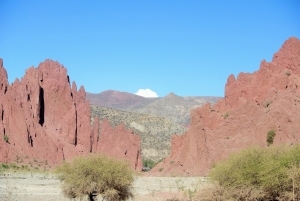 We arrive in Cafayate, which mark the beginning of the wine area, through the pretty quebradas de las flechas (all white) and las conchas (red). 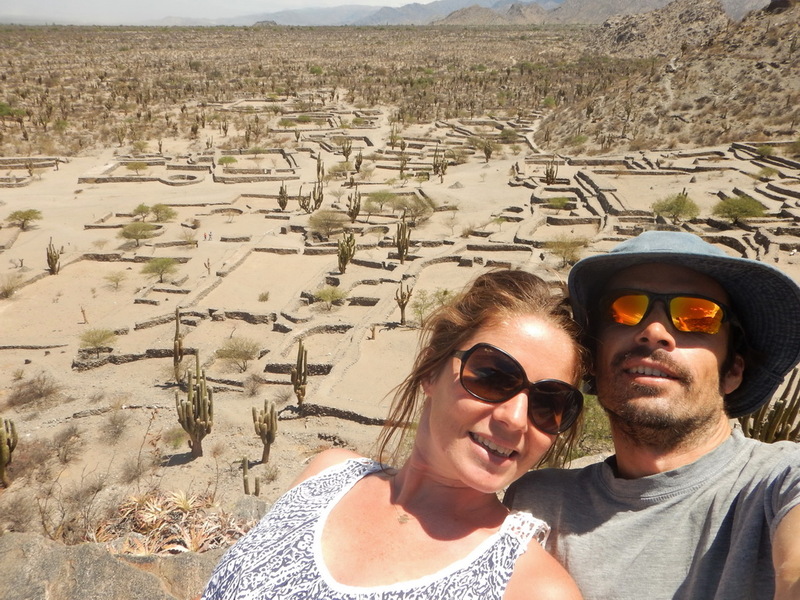 We take the chance to visit some Bodegas, taste their wine (the Malbec is quite good) and the local specials with quinoa and goat. 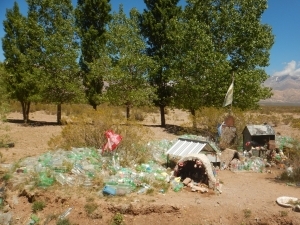 Since we arrived in Argentina, we have noticed many surprising things: everything is closed between 2 and 6 PM (impossible to buy a single apple), there are swimming pools everywhere but they are all empty, plain (without vanilia or strawberry taste) yoghurt doesn’t exist, small priory are everywhere along the road, and it seems you should honor them with plastic bottles, internet access is much worse than in Bolivia, and there more Swiss than anywhere else. 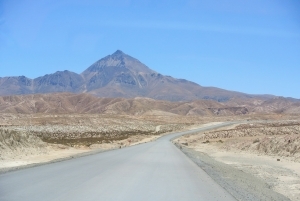 The road 40 keep going, sometimes as an endless strait asphalt ribon, sometimes as narrow dirt track climbing up mountains.